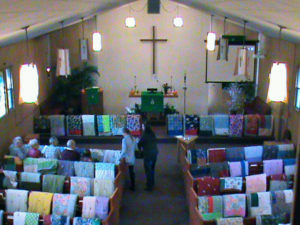 Twice per year the congregation joins with the Sew’n Sew Quilting Group for the Blessings of the Quilts. On October 23, 2016, almost 200 quilts were donated from the small congregation of Highland to Lutheran World Relief for distribution around the world. Previous donated quilts were sent to a remote area of Mali, West Africa.